SINGAPORE - Although it is only a mock-up of a HDB flat, for some elderly men it is a step nearer a real home. The space - which features two bedrooms and a kitchen - is a 'training ground' for residents of Acacia Home to prepare themselves for living in the community again. Although it has been operating at its Admiralty Road site since 2016, Acacia Home's new building was officially opened by the Minister for Social and Family Development, Mr Desmond Lee, on Tuesday (April 17). If found suitable, residents of the 250-capacity facility - run by voluntary welfare organisation Sathya Sai Social Services (4S) - can apply for a two-bedroom flat under the Joint Singles Scheme (JSS) which caters to poor and needy singles lacking housing options and family support. The mock HDB flat allows them to get used to sharing a living space with another person. 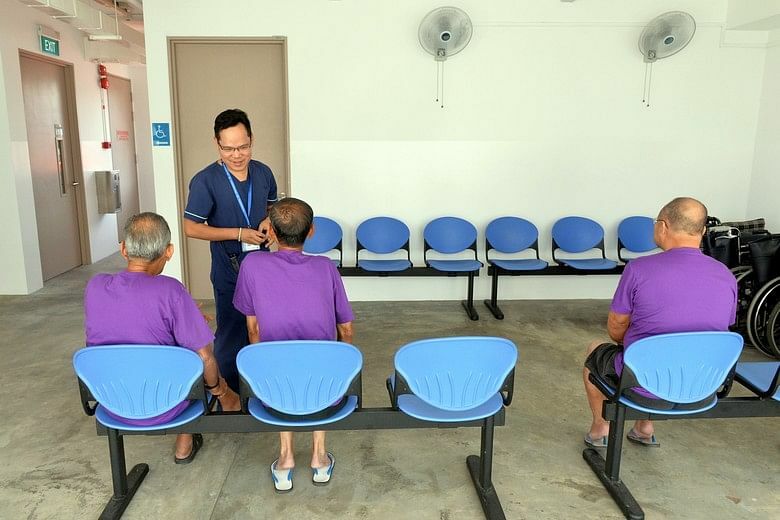 "We believe that the right environment is important for the successful rehabilitation of residents," said Mr Lee. "We have therefore built… a safe haven from the conditions some of our residents were living in before they were admitted." Acacia Home is one of the 12 welfare homes overseen and funded by the MSF - four of which are run by 4S. It features user-friendly features like gentle sloping ramps connecting its seven storeys. The MSF said it faces about 300 homeless cases each year. About half of those in welfare homes are admitted against their will and are referred when authorities find they have no place to stay or are not able to support themselves. At the end of last year, there were 1,823 destitute people residing in welfare homes - slightly down on the previous five years. Residents undergo rehabilitation programmes which impart social, work and life skills to prepare them for independent living. Those assessed to have high potential for reintegration are placed on external employment schemes like day release, home leave and pre-discharge programmes. Mr Lee cited the case of Mr Raju, who was admitted to Acacia Home in 2014 when he had no home or savings and was sleeping at a community centre. He is now working as a cleaner under the day release scheme and has applied for a HDB flat under the JSS with his God-sister. Acacia Home, which currently has 110 residents, was set up in 2012 and initially based at the Kaki Bukit Centre. In its time it has helped seven men find sustained employment as cleaners and at least five to find homes in rented HDB flats. Given that the JSS scheme mandates co-rental with another single, who might be a stranger, finding suitable a living environment can be problematic - especially if the two men do not see eye-to-eye. Latest MSF figures show 27 destitute people were readmitted to welfare homes in 2016, while 163 people were discharged. Some go on to independent living, or reside with family or friends. Others are discharged to residential care facilities and nursing homes. 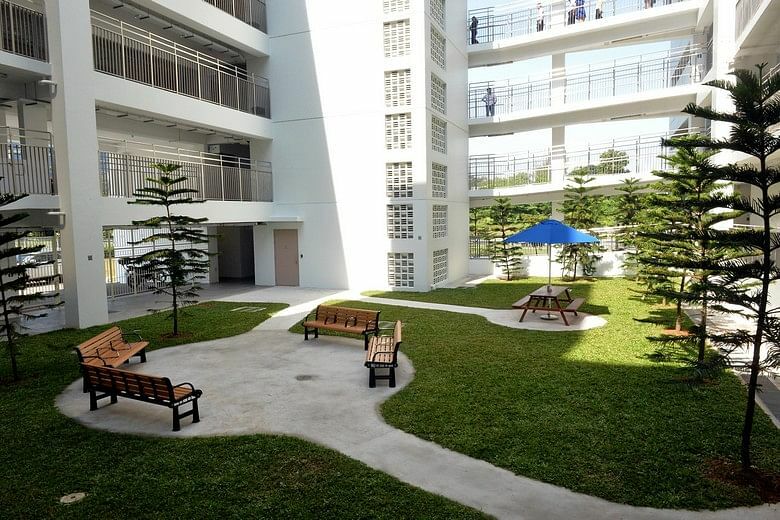 Acacia Home superintendent, Ms Regine Chan, said the mock HDB flat at Acacia Home helps in assessing residents' readiness to share a living space: "We are able to see if they get along well and assess their ability to self-care, (including) maintaining a clean environment and hygiene."